Tigerflex™ Silver Tiger™ STIG™ Series hose is an extremely heavy duty Polyurethane lined material handling hose. The extra thick abrasion resistant Polyurethane liner is designed for dry applications where severe abrasion is a factor. 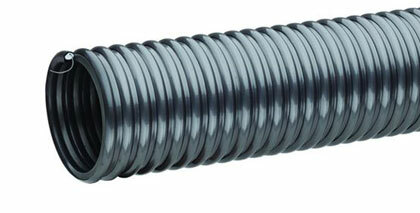 This liner provides for longer hose life and lower operating costs versus rubber or PVC hoses. The multi-strand grounding wire helps prevent the build-up of static electricity for added safety and to help keep material flowing smoothly. It’s embedded within the rigid helix to prevent contamination of transferred materials. The convoluted outer cover provides increased hose flexibility. Click here for more info.